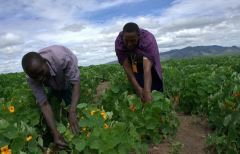 With more than two-thirds of Africa’s sub-Saharan population depending on agriculture for their livelihoods, agriculture is central to Africa’s economic development. Since small and medium-sized enterprises (SMEs) are the backbone of growth in production, employment and innovation it is crucial to provide an enabling environment for agricultural SMEs in Africa. Small and medium enterprises make up for about 50% of Tanzania’s Gross Domestic Product (GDP). There are currently more than a million entrepreneurs in Tanzania, running small, medium or micro enterprises responsible for generating up to 40% of total employment. Investing in SMEs is therefore, one of the most effective ways to reduce poverty and increase incomes. While more than one-quarter of the world’s arable land lies in Africa, it generates only 10 percent of global agricultural output. Despite the huge potential for growth in this sector, most of the businesses have remained largely informal thereby limiting the sector’s contribution to the growth of the economy. SMEs face many and varied challenges to their growth and operations”, says Allert Mentink, CEO of Match Maker Fund Management (who manages SME Impact Fund). “Most enterprises are struggling to survive due to lack financing. SMEs represent a ‘missing middle’ in African private sectors as these are dominated on the one hand, by (mostly informal) micro enterprises, and by large companies on the other.